Using kitchen shears, cut each lobster tail down the back, stopping at the last segment before the tail piece. Bend back the tail until you hear a loud crack. Slip a knife between the meat and the bottom membrane, freeing tail meat from the shell. Pull the meat up and over the shell, closing the shell shut beneath it. The tail meat, then, piggybacks on top of the shell. Coat the lobster meat with a generous coating of We Olive’s Lemon Olive Oil and sprinkle with freshly ground sea salt. Bake for 1-2 minutes per ounce of weight, if fresh. It might take longer if the tail is frozen. Place all of the ingredients in a large, flat-bottomed pan. Cook until the rhubarb is softened and the liquid has been reduced. This sauce is slightly more liquidy than a jam. 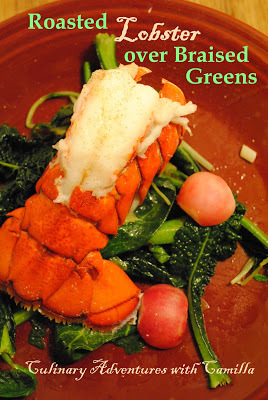 Place the cooked lobster tails on a bed of braised greens. Top with a tablespoon or two of rhubarb sauce.